Oh my God, I still fall over laughing whenever I hear that line! that part just cracks me up everytime! And in "Slipping on the Ice" I DIE when Dot hits the wall. Priceless moment. I also have Yakko's Universe stuck in my head, even though I'm working on an animation for Macadamia Nut with me as Dot, as Wakko, and as Yakko. Nice wallpaper of Yakko, Wakko and Dot! It really does fill the heart with joy! Hey, I recognize that "Taming of the Screwy" episode on the Vol.1 DVD. Nice desktop! Hehe, yep, this scene is one of my favorite parts of that episode. It's supposed to be a reference to "Wayne's World". Any chance you have the link? I absolutly ADORE the Animanaics. My family and I used to watch it all the time together. When my mom and I saw the promo for the DVD in Target, we just stopped. Are birthdays are relativley soon so I'm buying her the Pinky and the Brain one and she's buying me the Animaniacs one as birthday gifts. I Cant wait til their DVDs come out... although, im in the UK and i'm not even sure i can get it here.. everywhere i've looked hasn't got it and doesnt plan on getting it... i guess i'll havta resort to ebay..
Oh i got these on Netflix!! You really love Wakko don't you? For the desktop. I was just wondering if you had it. Yeah, the link where you got the pic would be awsome. I'd love to have a desktop that cool too. I really hope you can get it. I honestly dunno where i got it from. I did have the site saved on my favorites but when my computer went for repairs a couple of months ago all my bookmarks were deleted. I searched everywhere to find it for ya but had no luck. Oh you didn't have to do that! I was just wondering if you had it! I'll just keep looking. It's no problem. WOW!!!!!!! You did awsome job you did! It looks really cute!!! Hehe, i didnt draw it unfortunately, t'is just a screen shot of my desktop. I know, but still that is a great job on screen shot! God I adore that show. ADORABLE Background! I yelped for joy when I found out! I'll be getting it the DAY it comes out, no doubt. Ahah I'm driving my friends nuts, kind of not shutting up about it. They call me a dork then ask if they could borrow it when I get it! By the way your avatar is the official cutest on the DA. I just wanna hug Wakko there. Yeah... I was never too fond of Dot for some reason. She had a cool voice but she will never amount to the coolness of Yakko, or especially Wakko. And your welcome! yeah same here, dot was always my least favorite. she kinda only had 2 sides to her. cute and angry, thats about it. 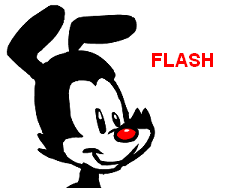 i mean, i liked her, but yakko an wakko had alot more too them than she did. dot was just there to be cute. Ooh! An A! fan like me!